After shoulder and knee surgeries, Christa Dietzen avoids strain and focuses on recovery. She started in all eight matches. The middle blocker has played professionally in China, Italy, and Turkey. "Sportswoman of the Year: Christa Harmotto-Dietzen. A Winner Above All Else"
"USA Volleyball Monitoring Vertical Jump Statistics with New Technology"
"Women's National Team Rio 2016 Bound!" "TAKE 5 with USA Volleyball's Christa Harmotto"
Every athlete experiences a setback during his or her career. That is just a part of sports. But with every setback, there's also a chance to comeback. Liberty Mutual Insurance sat down with USA Volleyball's Christa Harmotto to get her thoughts on making a strong comeback from her setback. When she stepped over the service line, the experience became real. When she heard the public address announcer call out her name, the moment crystalized. It was the type of gossip Terry Borkovic likes to hear. As the Hopewell girls volleyball coach arrived at an open gym session last week, he couldn't help but notice his players chatting about one person: Christa Harmotto. Who was the greatest sports figure to hail from Pennsylvania? The Times reveals the top athletes including Christa Dietzen, Mike Ditka, Joe Namath, and many other incredible athletes. Back in the spring, the entire U.S. women’s volleyball team hunkered down in a meeting room in the team’s home gym in Anaheim, California. For several hours, they discussed all sorts of topics, brainstorming goals and talking about each player’s strengths and weaknesses. Team captain Christa Harmotto-Dietzen laughed when asked if it felt like a retreat. "U.S. Women Named USOC's Best of January"
The U.S. Women’s National Volleyball Team has been named Best of January for the Team USA Awards presented by Dow, the United States Olympic Committee announced today. "Dietzen Talks on Values, Goals and Leadership"
Christa Dietzen (nee Harmotto), a 2012 Olympic silver medalist and captain of Team USA that won the 2014 FIVB World Championship, went back home to western Pennsylvania to deliver an inspiring message on Nov. 18 to a group of junior and senior high school volleyball players, friends and family at Hopewell High School. "U.S. Volleyball Player Trusts God to Overcome Hurdles"
Viewers of the 2012 Olympic Games in London might have noticed a confident, powerful member of the silver medal-winning U.S. women’s volleyball team in middle blocker Christa Harmotto. What they didn’t see is the transformation through faith that brought her to that point. Christa Harmotto is London-bound. 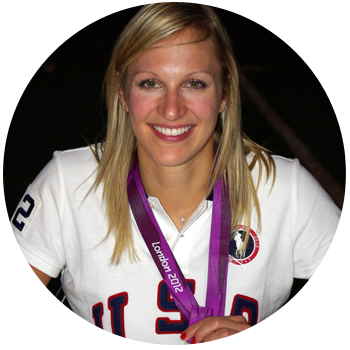 The Hopewell High School and Penn State graduate was named Tuesday to the U.S. women's national volleyball team's roster for the 2012 London Olympics next month.